delivered them from the danger by swallowing the terrible fire. 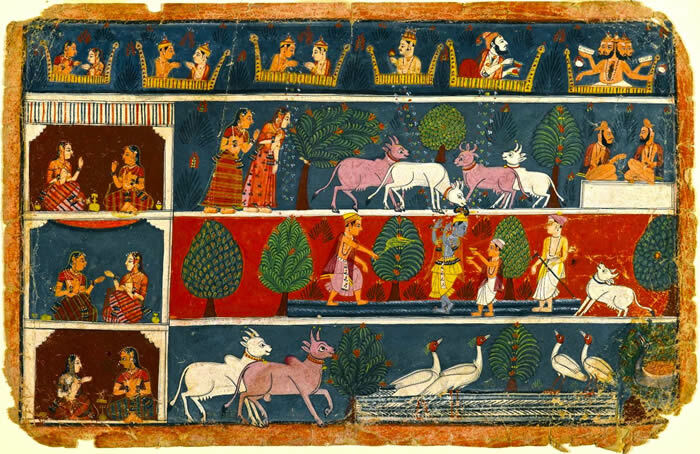 (25) The Lord and Balarâma surrounded by the cows and boys thus for their enjoyment entered that most resplendent forest with its ripe dates and jambu fruits. 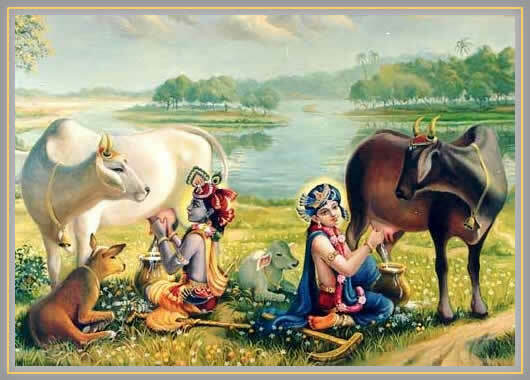 (26) The cows moved slowly because of their big and heavy udders, but being called by the Lord they came quickly with their udders wet out of affection. 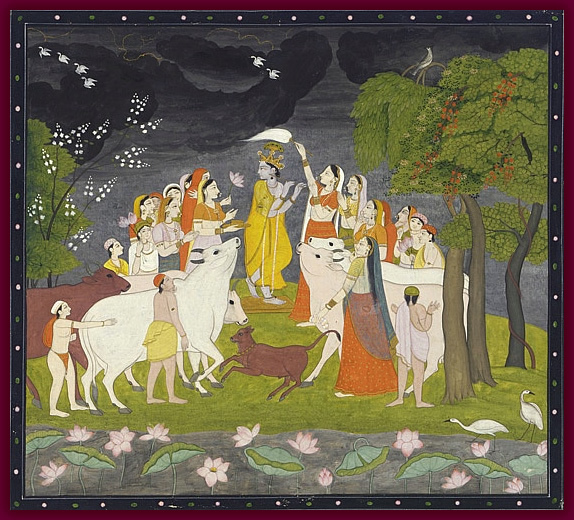 (32) With Râma and Kes'ava residing this way in Vraja, the fall season manifested itself in full with a cloudless sky, the clearest water and a gentle wind. 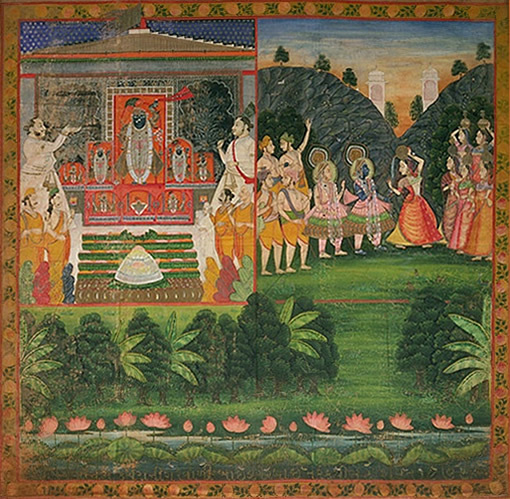 (33) In autumn the lotuses regenerated and the bodies of water regained their original state [of purity], just as the minds of the fallen are restored by the practice of devotional service. (5) [Before their mind's eye] His glories were sung by the group of cowherds and the holes of His flute were filled by the nectar of His lips as He entered the forest of Vrindâvana that was so enchanting because of His footprints. 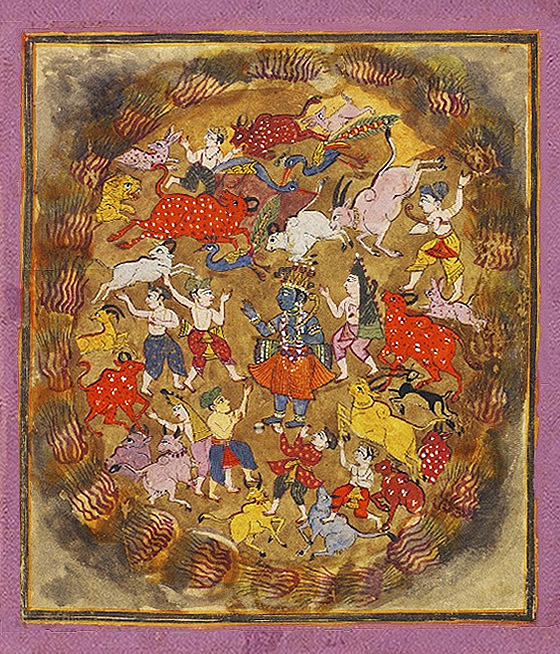 [They pictured Him] with a peacock feather on His head, a body like that of the best dancers, a blue karnikâra lotus behind His ears, golden, yellow colored garments and the vaijayantî garland around His neck [the garland 'of victory' with flowers of five different colors]. 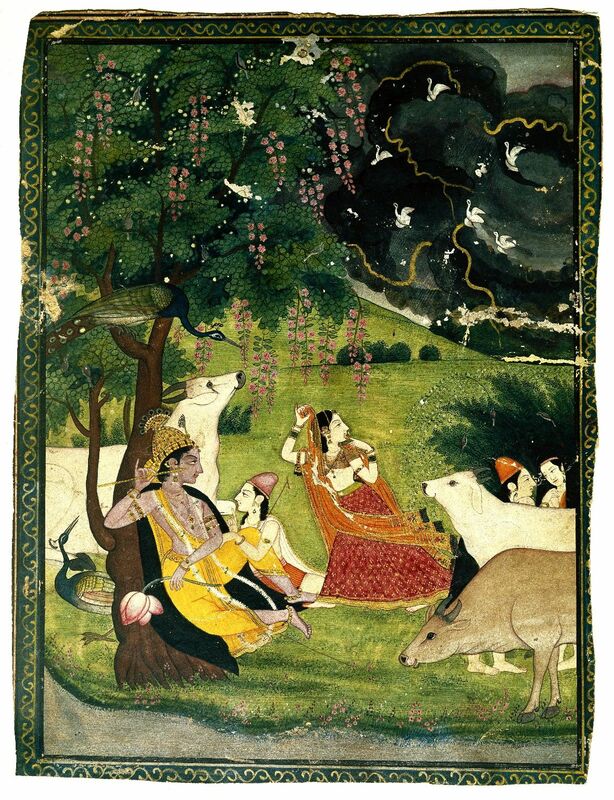 (9) He stole their clothes away and quickly climbed in a Kadamba tree. Laughing together with the boys He made fun by saying: (10) 'Come here oh girls if you like, and take each your own garment. I am serious, it is not a joke, since you must be tired because of the vow. (7) Râma and Acyuta graze Their cows not far from here and being hungry they want to ask you if you could supply Them with some food oh twice-born ones. So, if you have faith, then please donate oh finest knowers of the religion.